В 1926 году "Fairey" приняла решение участвовать в тендере на разработку двухместного разведчика в вариантах гидросамолета и самолета аэродромного базирования согласно спецификации O.12/26. В результате появился Fairey Fleetwing, выполнивший первый полет ДальшеMore>>> в Нортхолте 16 мая 1929 года в сухопутном варианте и бипланной коробкой с крыльями из дерева. К началу испытаний на авианосце "Фьюриес" деревянные крылья заменили металлическими. Конкурс на самолет был исключительно жестким: конкурентами Fairey Fleetwing являлись Blackburn Nautilus, Short Gurnard и Hawker Osprey. Победителем конкурса признали Hawker Osprey, хотя его результаты пытались оспорить. Единственный Fleetwing использовался "Fairey" для различных целей, пока он не получил повреждения при посадке в море при сильном волнении. THE FAIREY AVIATION CO., LTD.
One Fairey III F, Napier "Lion XI," to be shown in skeleton. 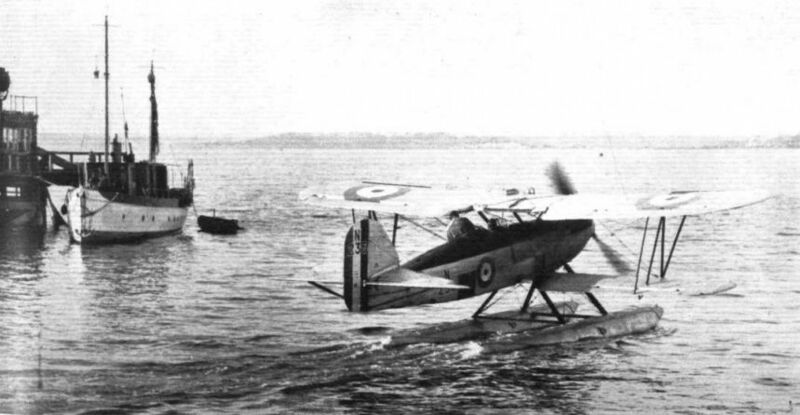 One III F 3-seater ("Lion XI") Fleet Air Arm Seaplane. One III F 2-seater (" Jaguar VI") General Purpose landplane. 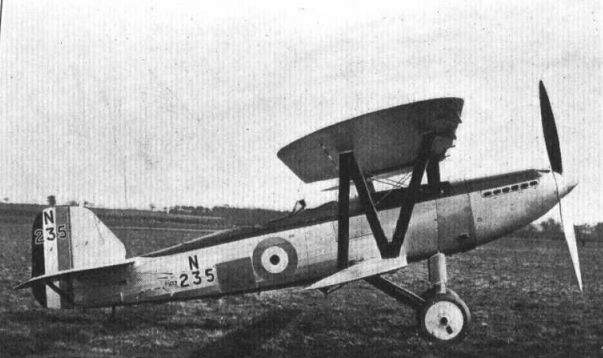 One "Fox" 2-seater (Rolls-Royce F) high-performance light day bomber. One Long-Distance Monoplane (Napier "Lion"). One "Firefly II" (Rolls-Royce F) single-seater interception fighter. One single-seater fighter Ship 'plane with alternative land undercarriage (Rolls-Royce F). One Fairey two-seater Fleet fighter reconnaissance seaplane (Rolls-Royce F). Concerning the remaining three Fairey types to be exhibited at Olympia comparatively little may be said, these machines being still on the "Part Publication" list of the British Air Ministry. Nor, we very much regret, has it been found possible to include three-view general arrangement drawings of them. The general appearance of these three Fairey machines is, however, shown by photographs. In spite of its incredibly clumsy official title of "Two-seater Fleet Fighter Reconnaissance Shipplane," this Fairey machine, which will be exhibited as a seaplane, is a very interesting and novel type of Fleet Air Arm machine. In the shipplane form it is supplied with a land undercarriage. Following somewhat on the lines of the famous "Fox," this machine has been designed to fulfil the requirements of Fleet Air Arm duties and is one of the latest types produced for this purpose. It is a two-seater biplane of all-metal construction, with main planes of unequal chord and fairly heavily staggered. The lower plane chord is quite small, and the machine might almost be classed as a "sesquiplane." The wings are made to fold. A fuselage of small cross-section, and yet with roomy cockpits, is employed, and the streamline form is exceptionally good for a two-seater. Quickly-detachable cowling is fitted to the engine installation and cockpits, which enables these parts to be readily inspected. Ailerons of the "Frise" type are fitted, as well as Handley Page automatic wing tip slots to the top plane. The tail plane incidence is variable. A Rolls-Royce "F"-type supercharged engine is fitted as standard, and the cooling system includes both retractable and wing radiators. The Vee undercarriage of the shipplane version has special oleo legs of highly streamlined section, and independently operated wheel brakes are fitted. The float undercarriage, which will be shown, has twin floats of Duralumin. The Fairey high-speed gun mounting is installed in the rear cockpit. The top centre-section incorporates a hoisting sling. The main dimensions of the Fairey "Two-seater Fleet Fighter Reconnaissance Seaplane" are: Wing span, upper plane, 37 ft.; upper chord, 7 ft. 3 in. ; lower chord, 4 ft. 3 in. ; overall height, 11 ft.
Изящный двухместный биплан мог эксплуатироваться как с колесным, так и с поплавковым шасси, но в серию Fairey Fleetwing не пошел. В задней кабине предусмотрена возможность монтажа турели Fairey High-Speed с одним пулеметом Lewis, в нерабочем положении убираемой в фюзеляж. 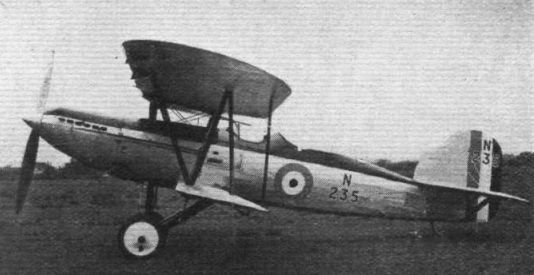 Fairey Fleetwing 2-seater fleet fighter. 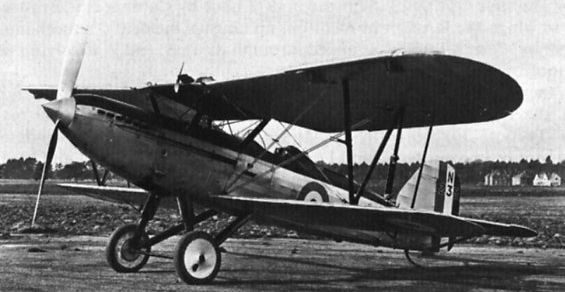 FAIREY 2-SEATER FLEET FIGHTER (Rolls-Royce "F"). 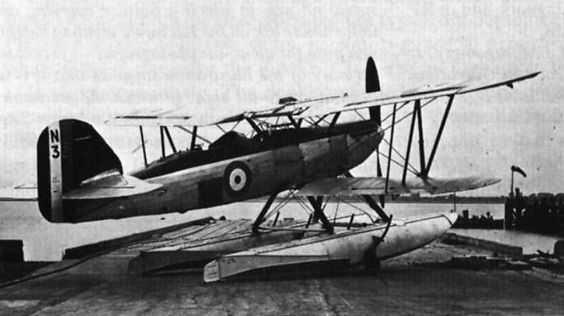 The Fairey Fleetwing two-seat reconnaissance-fighter in November 1930 for trials as a floatplane. TESTING CONDITIONS: Squadron Leader Orlebar going out in a Fairey "Fleetwing" to see if the weather is suitable for the Schneider machines. With him is Mr. W. Lappin of the Rolls-Royce Company.